Are after-school math centers really worth the money? Parents and education experts do the math. 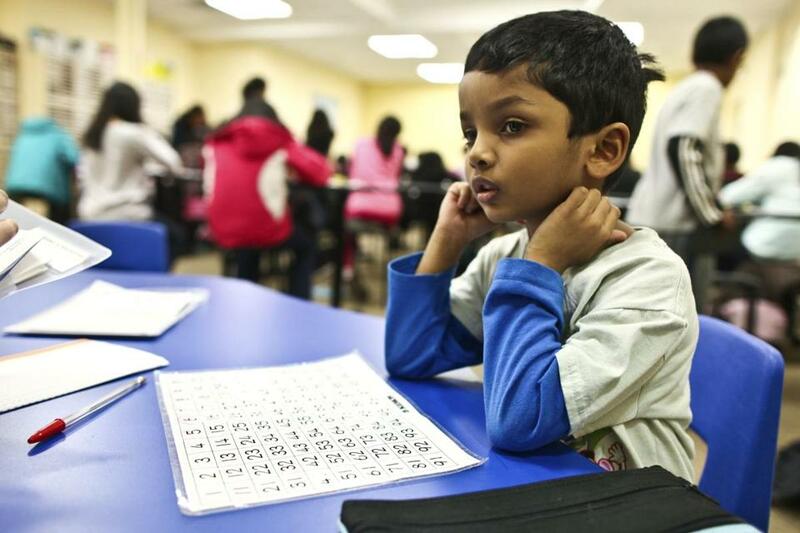 ON THE GRID: Five-year-old Krishna Kumarappan attends a class at the Kumon after-school. Try to figure out the following pattern. JUNIOR ACHIEVEMENT: This Kumon class is designed for the very young. The Framingham center’s youngest pupil wasn’t yet 3 when she began her studies there. ON ONE HAND, there is little solid evidence to show that these programs do anything at all. Many mathematics education specialists – including Barbara Brizuela of Tufts University and Janice Grow-Maienza of Truman State University in Missouri – say they are skeptical about the efficacy of after-school math centers. Yet even professors of mathematics education enroll their children in enrichment classes. Jon Star is an associate professor at Harvard’s Graduate School of Education who studies how children learn mathematics, and he sent his then 5-year-old daughter and 8-year-old son to The Math Circle for a semester (the family is spending a semester abroad, and the children are not taking after-school math now). While he didn’t see a radical change in their performance, he says that it’s hard to know what the long-term impact of the instruction will be, because “in math education we don’t often ask longitudinal questions.” Star adds that there is no easy way for parents to evaluate these programs. Glenn Ellison is an economics professor at MIT and the father of three girls ages 8 to 17 who have taken classes at four different programs (Girls’ Angle, IDEA Math, the Math Circle, and the Russian School). As a coach for middle school math competitions, he doesn’t need academic research to convince him that the programs work. Ellison says that those students who have been exposed to algebra early through programs like the Russian School are simply quicker than their peers who have not had extra instruction. OF COURSE, not all of the “cod liver oil’’ is equally palatable to all kids. Some parents leave repetition-based programs like Kumon and ALOHA because of the daily grind of practice. Brookline full-time mother of three Christina Lavallee let her two elementary school-age sons drop out of Kumon because they hated the repetition and she hated the battles to get them to do the homework. Then there are the costs. Monthly tuition at the Russian School is $147 to $300. Classes at Chyten, which run between $380 and $740 per month, are the priciest in the area. Kumon describes itself as the largest after-school math enrichment program in the world. With 253,088 students in centers around the United States paying $95 to $125 per month, a Kumon franchise can be a lucrative investment. 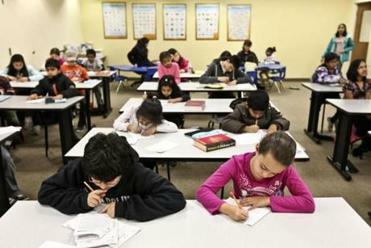 Kumon North America CFO Joe Nativo reports that despite the sluggish economy, enrollment continues to surge nationwide. Open locally since 1987, the company has seen brisk growth in the Boston area: Since January 2000, it has expanded from 24 centers with 952 students to 40 centers with 6,192 students. SOLVED! Students at Girls’ Angle in Cambridge, where thinking creatively about math is stressed, periodically tackle problems sent in by the public. 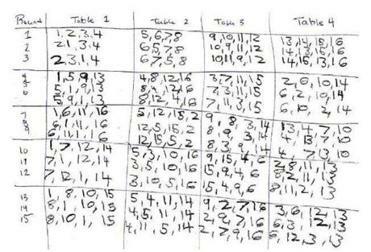 One such challenge was to develop a seating chart for a 16-player euchre tournament at a senior center in Rochester, New York. The center “had tried to make one and couldn’t,” says program director Ken Fan. “It’s not a trivial problem.” The students’ first stab was close, though not error-free, says Fan, a math PhD who started the nonprofit after-school program especially for girls. But within three hours the mixed-ages group had cracked it. “They literally came up with the most efficient chart you could come up with,” says Fan, clearly proud of the achievement. Whether it’s for help with memorizing multiplication tables or planting the seeds for a career in business or science, parents seem to believe in the power of extracurricular math education. For the 2008-2009 school year, the Newton Public Schools reported that the number of students who participated in math enrichment centers or used private tutors doubled from elementary school to middle school. This doesn’t surprise math teachers. Jayne Bamford Lynch, an instructor at Lesley University, has taught mathematics for 25 years and is a district math coach in the Cambridge school system. Lynch says that all teachers, particularly in elementary schools, offer choices in math instruction to focus on different learning strengths – for example, visual versus hands-on. But by middle school, just as students begin to think more independently, their choices may be limited because of the increased emphasis on standards and testing. This, she says, leads some families to look outside the school systems for math instruction. And some parents are entering children in extracurricular programs at ever younger ages. Anna Charny of the MetroWest School reports that last academic year, her center went from one kindergarten class per week to two, and that this year there are three large classes – at the school, classes range from five to 16 students, but the average class size is 10 – so she’s considering adding a fourth session. MORE GENERALLY, what does help? It seems to depend on the child’s interests, needs, and learning style. Other experts echo the idea that the goal of extracurricular classes should be to generate enthusiasm and love for math, not just improve test scores and speed. Scott Govoni, who has taught math for 14 years in the Andover school system, says that students learn math best when the focus is on exploration and understanding, not just regurgitation and computation. For advanced students, he says, challenging them through enrichment programs can help them retain interest in math and perhaps even become great mathematicians. It’s useful to remember that kids who do find extra instruction helpful don’t need to stick with one program for their entire academic career. MetroWest’s Charny says she very occasionally has encouraged students to turn to other programs – for example, Kumon for students who need a lot of repetition to learn. Myrtha Chang, director of the Mathnasium program in Newton, offers another piece practical advice. “A lot of these places do a free trial. You should always take advantage of that,” she says. And above all, Chang says, “there is no one center that works for every child.” In Boston, there are plenty to choose from.